Wonderful Review of a competent car. Also credit to Honda for pricing it reasonably well. BHPian PPS points out that Honda hasn’t even provided a joystick for ORVM adjustment in the base variants! I'm quite perplexed with this omission once again! But Honda on the other hand has given 4 parking sensors as standard, which has to be a segment first on the base variant, perhaps! Rear wheel wells once again don't get any cladding! Honda has again been stingy when it comes to a few things but delivered a better product than the previous generation Amaze for sure. Last edited by bblost : 31st July 2018 at 22:13. Reason: Formatting issue with icon. There have been two good Citys sold in India - the ugly 2nd generation (popularly known as dolphin shape) which truly had quality levels better than the segment, and the 3rd gen City which was an amazing all-rounder for its time (and IMHO better built than the current 4th-gen). I have experienced the 'real' Honda experience only with the Civic I owned in India, and the Accord I had in USA. Both were top class products. Spot On! absolutely agree - its such a treat to see Dolphin shape city's with interiors that appear not to have aged a day. I dont mean any offense to existing owners of Honda cars - especially the new Amaze. That little bit of clever thinking and magic that made it rise above its Japanese and Korean competition. Honda's new cars however, are purely Mass Market but with + + pricing! (they will surely hike Amaze prices also) or is it that Honda feels only customers for the City and above deserve better quality? That said - am happy that the Amaze is a great leap forward from the old one but certainly a lost opportunity, as we Honda enthusiasts will need to wait some more to see Honda getting their game back. While I agree with you, it's the mass market game. 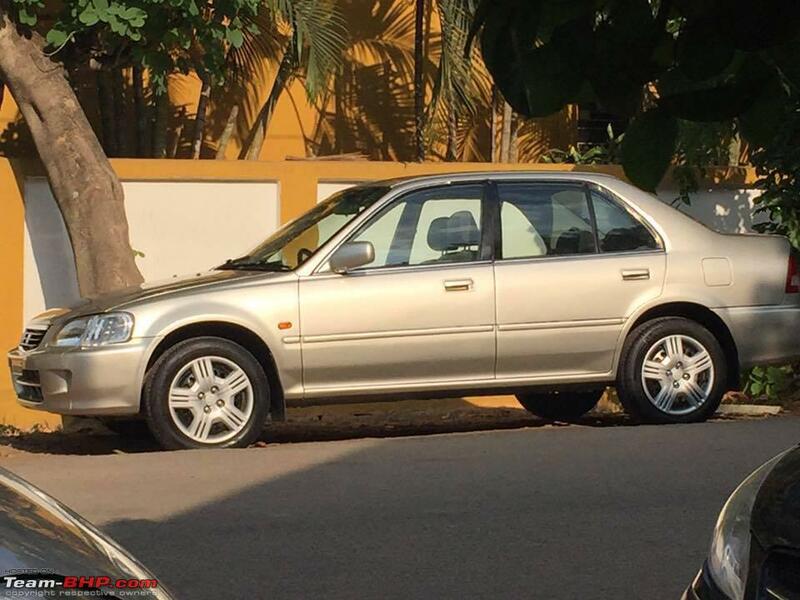 Frankly, even the car that every enthusiast raves about - the 1st gen Honda City (which me & you have both owned) - was CRAP compared to the Mitsubishi Lancer (which also I had owned). The only good thing about the City was its 1.5L / Vtec engine. Everything else was rubbish. I still have the City though she does have a new stablemate in a pre-worshipped Jetta diesel. The City had her flaws, sure and was best enjoyed between 80-120 kmph - but I think it was combination of low seating position, visibility, engine, gearbox, clutch and very good brakes (for her time), that made it brilliant to drive. In fact, the pricing should go up by tomorrow, AUG 01. The current prices are "introductory" and won't last beyond today evening. That's what I learnt from Perfect Honda, Trivandrum last week. In fact, the pricing should go up by tomorrow, AUG 01. GTO this line made my day!! Please copyright it!! Well said. Makes me think, just like the i20 invented the concept of a 'premium hatchback', I think the market today will accept a truly premium 'compact sedan'. So true!! I think market or at least the enthusiasts want a reasonably priced premium feeling compact sedan. I was in the same boat a few months back. I tried the Amaze Diesel CVT and BREZZA AMT Extensively.. ~50Kms Test Drives in urban, rural, good and bad roads. And. I went for Nexon AMT. Thank you charan for this informative post. I believe an extensive TD is the only way to go about this conundrum. Tata received so much negative word of mouth in the last decade that getting a non petrolhead to even consider a Tata car is very difficult. A product like Nexon selling less than half the Brezza is a testament to it. Space wise how would you rate the above 3 cars since the back seat is also important as it will be used as a 5 seater occasionally. Last edited by ToyotaFan : 31st July 2018 at 23:34. Test drove the Amaze CVT Diesel. The car drove amaz-ingly. The car was eager to leap with 4 people on board. I may be feeling this as I am a petrol guy with little experience for diesel torque. But absolutely loved the car from a drive perspective. The fact that it doesn't feek premium with ordinary HU and no sunroof made me look the other way. But @11 odd lakhs, that's the best way to go. I know it's not an apt comparison but I wanted to know which would make a better buy Amaze Diesel CVT S at 8.4 lakh or the Maruti Brezza VDI AMT at 8.54 lakh. 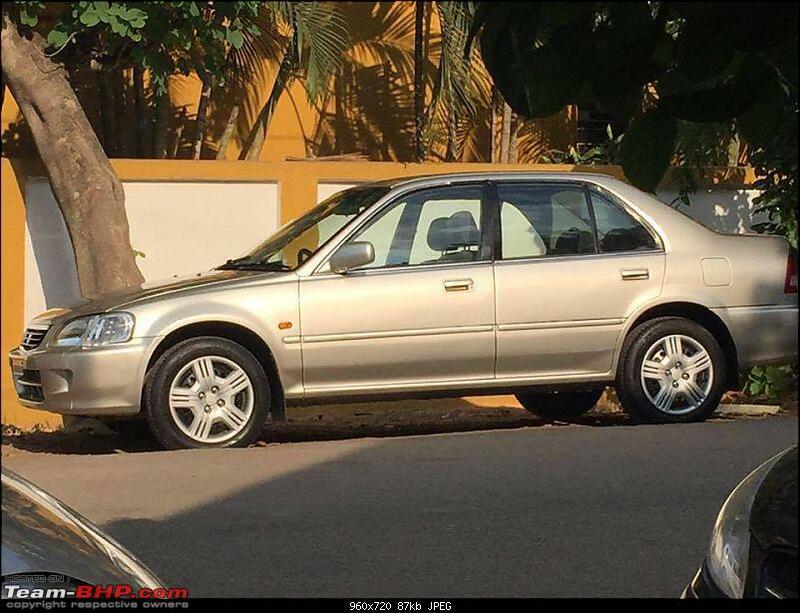 I had read somewhere that the mating in the Brezza is much better then the DZire though not sure. Could not get my hands on a TD car hence it's just a speculation. I think amaze would be better to drive then the Brezza but which one would be the better car overall as I feel there would be lot of cross shopping between the two. My sister is looking to pick one out of these two hence advise needed. Thanks in advance. I'm also deciding between the two. Both cars have some faults but I think it comes down to your needs. For me personally, the flat folding rear seat in the Brezza is a huge advantage. As the car is going to be almost exclusively driven in the city i don't see too much of a hindrance in the AMT vs the CVT. If you drive an AMT more like a manual (modulating your acceleration as if you were shifting gears) there is limited issues, but than again that means its more work. The CVT is excellent and a very smooth and refined response. Never underpowered. So if its going to be driven a lot and for a newer driver it may be better. Space wise how would you rate the above 3 cars since the back seat is also important as it will be used as a 5 seater occasionally. I felt all three have excellent back seat space. During test drives, I tagged my family and relatives along, atleast 2 in the back seat, preferably 3. W.R.T Space did not hear a single complaint in any of the three. Amaze was thumbs down due to suspension, but Brezza and Nexon were given a thumbs up. I had 3 passengers (Well built, I might add) and occasionally 4 as well in the Nexon rear seat, no complaints at all. Infact they praised the space on offer. It may be OT, but doesn't Yaris qualify to fit in the same? Ok, maybe not enthusiastic, but I believe it fits right into the Premium Compact Sedan category. I have yet to TD the new Amaze, but it appears to be an answer to someone like me who simply wants a fuss-free petrol AT to commute in the B2B Bangalore traffic. At this price point, it appears to be a VFM product. I agree every car has its flaws, some perceived and some actual, and Amaze is no exception. As a wise man once suggested to me, when buying a car, fix your budget and then start hunting and short-listing. Else, it is a never-ending process to finalize. Last edited by prashkul : 1st August 2018 at 13:24. Excellent and crisp Review. I am planning to buy a CS and was confused between TIGOR, DZIRE and Amaze however this review has helped me a lot in zeroing on Amaze. I have yet to TD the new Amaze, but it appears to be an answer to someone like me who simply wants a fuss-free petrol AT to commute in the B2B Bangalore traffic. Yaris base model starts at 8.75 lacs and then even it's top model doesn't have a Android Auto or Apple Car play which I get in Amaze and Dzire. Yaris is Toyota's overconfidence to milk the Indian customer for T badge. If they would have priced it sensibly like other markets, it would have been a great buy IMO. But Toyota can't be blamed as they are milking nicely through Fortuner and Innova. Last edited by PraNeel : 1st August 2018 at 16:04. Amaze factory dispatches in July = 10,180 . Guess this is the first Honda to ever get into the 5 digits in India. Congrats! 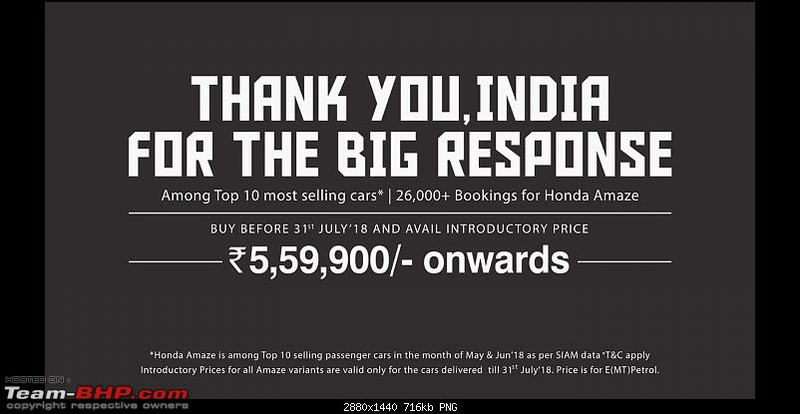 Honda Amaze again Amazes with Very Good Sales Numbers. Honda sold 10180 units of New Amaze last month. 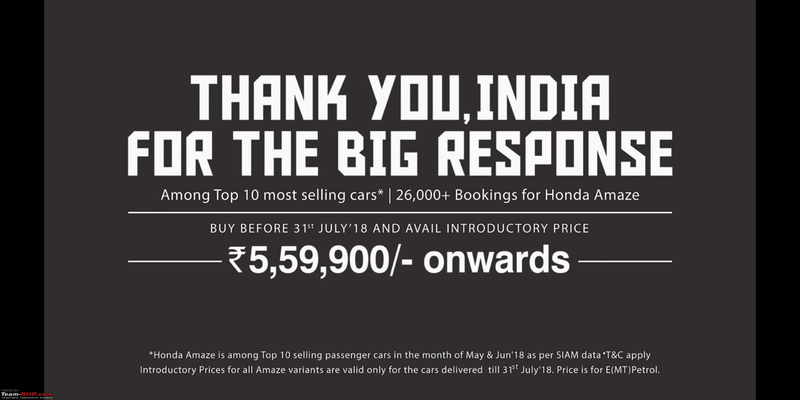 Records highest ever sales for a Honda car in India. Diesel CVT is the main attraction & also a benchmark in its Segment. Excellent month for Honda as it has gain 17% Sales improvement compared to same month last year. Wow, was keen to know this number having seen a bit of dip in June. There was so much of positive momentum online in July for this car especially Diesel CVT where multiple folks did a comparison with its competitors. The competition was just doing what GTO said, trying to put the lipstick of features and faux wood finish on a jerky AMT. I am glad the public are rewarding a brave attempt by Honda here with aggressive pricing while bringing in the CVT.